A horror anthology that doesn't feel like one, SOUTHBOUND is a well-produced string of tales all set on a dusty dessert highway. The five stories are loosely connected, some more than others. Two blood-soaked men stop at a gas station to clean up and refuel, while something eerie pursues them. An indie band heads to their next gig after the death of one of their bandmates. A man tries to save the life of a girl he has hit with his car. Customers in a small town bar get a surprise when a man bursts in with a rifle. Finally, a family vacation is interrupted by a very unwelcome, late-night knock at the door. All dealing with themes of punishment and redemption, each self-contained segment seamlessly flows into the next. The cohesiveness of the movie is greatly helped by the consistently excellent acting, directing, and shooting, elevating it above the wandering nature of the script and of anthologies in general. Directors Roxanne Benjamin, David Bruckner, Patrick Horvath and Radio Silence, most of whom also wrote, do a nice job of balancing their own styles and horror subgenres, while still maintaining an overarching tone and aesthetic. The voices behind this feel fresh and unique, and it’s nice to see horror that doesn’t feel ripped off from a predecessor. The film’s biggest flaw may be that within its meandering plot, several of the stories feel like they aren’t quite complete. There isn’t enough exposition provided in a few of the tales for the audience to truly understand backstories and motives. At times, there are hints of deeper, more complex parables here that are never fully explored or explained. On the other hand, some might argue this is an asset, creating a mysterious, elusive nature to the storytelling that plays like a southwestern nightmare. A lot of questions go unanswered, but often it’s creepier that way. The fact that this sun-scorched, desolate world is full of characters and plots that one wants to know more about is, indeed, its own testament to the film. 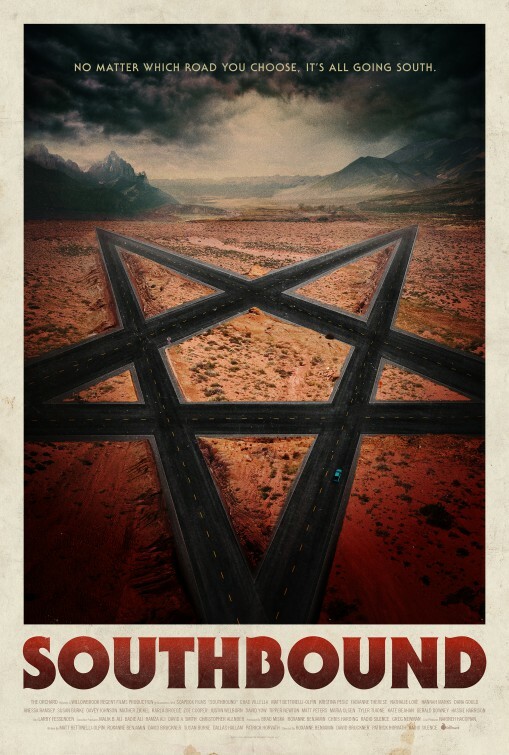 With doses of surrealism, the supernatural, and well-executed gore, SOUTHBOUND tells a satisfying and creepy set of stories without the usual inconsistency in quality and narrative style that often comes with many crews contributing to the same feature. While the stories may leave some wishing there were meatier explanations, there is more than enough here to enjoy the ride.